Alepo earned a 2016 Policy Award in the category of “Best Use of Policy on a Device.” The announcement was made during the 2016 Policy Control Conference in Berlin, Germany. 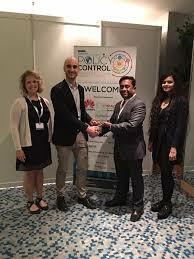 Thursday, April 7, 2016, Berlin, Germany and Austin, TX – Alepo (www.alepo.com) – a global provider of core network and IT software solutions for communications service providers, was announced the winner of a 2016 Policy Award during the Policy Control Conference in Berlin, Germany. Alepo won in the category of “Best Use of Policy on a Device” for its policy control companion mobile app. The policy control awards were presented by Informa and judged by a panel of leading policy control experts: (Guy Redmill, Managing Director, Redmill Marketing Associates; Hugh Roberts, Senior Communications & Media Strategist / Evangelist, Virtual Spanner; Glen Ragoonanan, Principal Analyst, Analysys Mason; Shira Levine, Directing Analyst, Service Enablement and Subscriber Intelligence, IHS; Alberto Diez, Telecommunications & Policy Control Expert, Independent). Entrants were judged on their originality, innovation, and leadership in the area of policy and charging control. The Alepo “My Mobile Buddy” mobile app puts policy control in the pockets of mobile subscribers, creating a highly contextual and personalized digital experience. At the same time, it provides mobile operators with a truly end-to-end solution for data monetization that requires almost zero effort to deploy and manage. Alepo built the Alepo My Mobile Buddy mobile app with the primary objective of delivering a complete market-ready solution for data monetization, one that would enable the mobile operator to differentiate itself in an increasingly competitive marketplace. With the ability to make policy decision directly from his smartphone, the mobile subscriber becomes the decision-maker for his digital experience, dictating when, where, and how he wants to consume services with the ease and enjoyment of a sophisticated and sleek mobile app. From within the app, subscribers can gift mobile data to other subscribers, allocate data to family members within the same plan, manage parental controls, purchase international roaming data passes, and more. The Alepo My Mobile Buddy mobile app benefits both the mobile operator and the end subscriber. Mobile operators enjoy a fully managed solution that encourages purchase and consumption of data services as valued experiences, and elevates the mobile operator’s brand as modern and customer-centric. Alepo will be attending East Africa Com on May 18th & 19th in Nairobi, Kenya. Meet our expert’s team there and learn how Alepo’s PCRF solution makes it possible for mobile operators to harness their 3G and LTE data services in order to increase ARPU and profitability of the networks.